10 Winter Quarters Camp, Queen’s Birthday weekend, June. 12ga flintlock on Fri 8th May, the final day of the 2009 season. Welcome! I’ve dug deep into some old files for this edition’s feature article; I know you won’t mind a little serious dialogue on our sporting patrimony. – Back in the early 1990’s when Bosnia was a hotspot of conflict, a robust discussion on duck hunting occurred at my workplace lunch table. It caused me to pen a few lines about the word “sport” which were printed in a SSAA sub-club newsletter; lines I now re-present here as they remain topical with hunters and discuss a danger still relevant to all true sportsmen. Have you, like me, been on the receiving end of criticism and condemnation for your shooting and hunting sport? Each duck opening we are confronted with a familiar minority of a bigoted and poorly informed anti-hunting fraternity claiming that duck hunting is not sport; therefore hunters cannot be sportsmen or sportswomen. Their false agenda is maintained year after year and the ripples continue throughout the whole year for deer hunters, fishermen and other game hunters. The rhetoric often used by these animal-liberationists / conservationists is that since the “defenseless” game pursued is not armed similarly to the hunter there can be no sport. No doubt they would all refer to the time-weary conflicts in the Middle East as “sport”. Small diversions, old chap! More in-depth discussions with these individuals will usually reveal them to be ardent anti-gun campaigners, with no stake, little real interest, and even less knowledge, of viable farming or of sound wildlife conservation practices. n. amusement, diversion, entertainment, frolic, fun, game, recreation. n. one who engages in sport; a good loser. n. 1. amusement, diversion, fun. 2. pastime, game, outdoor pastime, e.g. hunting, fishing, racing, cricket, football. n. person fond of sports, person who behaves fairly and generously. n. person fond of sports, esp. of hunting etc; person who behaves fairly and generously. Notice that this reference “esp. of hunting etc.” has been omitted in the 1987 Aust. Edition. Now you can see the cause of my alarm. Here the word “especially” is of necessity abbreviated to “esp.”, however its significance diminishes with that reduction, then eventually is lost and omitted in the most modern reference work. Let’s delve further into the history of the words sport & sportsman. The 1975 Pocket Oxford under sport refers to “good sport” being a “good bag when shooting” a sportsman is “a person fond of hunting and such sports”. Therefore a “good sportsman” is one capable of filling his bag. There is no mention of cricket, football, etc., and nothing of being a good loser. Being a sportsman of 1940’s vintage these earlier definitions better fitted my schooling days; however I do not wish to take anything from cricket or football games or for that matter the Olympic Games. My last ready avenue of information was my treasured, giant size Shorter Oxford English Dictionary 3rd Edition 1933. An extremely large volume containing 2500 quarto pages covering the history of the general English vocabulary for over one thousand years from the days of King Alfred 849-899A.D. to the 1930’s. 1440. 1. Pleasant pastime, amusement, diversion. 1653. 2. Pastime afforded by the endeavour to take or kill wild animals, game or fish. 1863. 3. Participation in games or exercises, esp. those pursued in the open air. 1706. 1. A man who follows, engages in, or practices sport; esp. (especially) one who hunts or shoots wild animals or game for pleasure. 1848. 2. U.S.A. gambler, betting man. 1894. 3. One who displays the typical good qualities of a sportsman. So there you have it – The word sport was fitted to hunting and recorded in English literature at least 350 years ago. The word “sportsman” was used to describe those engaged in hunting in Oxford English at least since 1706; this clearly precedes all modern level-playing-field games or sports that commercial interests have popularised on radio and television. The 1933 Oxford makes no suggestion of a sportsman being a good loser. That only appeared in the Collins 1992 edition. A good loser? Be buggered! I’m not about to lose my sport to muddied name-calling when sportsman “especially” refers to hunters. This is not a game; English is a modern language and is constantly being revised. Don’t let these non-sporting anti-gun fanatics make a trophy of our sporting heritage or of our descriptive name; the name we “fairly and generously” share to more recent “pleasant pastimes”. We should take every opportunity to educate any audience with the original Oxford English definition of a sportsman – A person fond of sports, especially hunting of game for pleasure. About the same time I wrote the previous article I contacted poet Bill Burke seeking permission to print his fine poem in a deerstalkers newsletter. It’s a truly marvellous poem, one that I’ve read many times, having had a copy attached to my fridge door ever since. I’m sure Bill won’t mind me once again presenting his fine words – to all of our “Around the Traps” readers. On the trail of the timid deer? Till at last you found him near? As so carefully you aim? Yet found that the thrill’s the same? In the dark before the dawn? And the world becomes reborn? Have you shot your bag in the morning light? And in pity let them go? When the cold bit your legs like a knife? As he fought you for his life? With the death-fly in his jaw? So that he may fight once more? When a Sportsman ventures into the field “hunting game for pleasure” we are not suggesting that the single act of shooting (squeezing the trigger) is the pleasure. Indeed it is often a moment of sadness! The pleasure lies in the preparation and anticipation of the hunt, the actual hunt, which might take hours or even days, and after the quarry is taken there is pleasure in preparing the meat, the cooking and eating of game harvested by our own efforts. It can be likened to the pleasure a gardener obtains preparing his soil, sowing the seed, watering, tending to weeds, harvesting the vegetables and the cooking and eating of fresh home-grown produce. Store-bought foods simply don’t provide such pleasures! Our cover photo is a self portrait by Paul on closing day for the 2009 duck season. Paul has filled the daily bag limit of two Black duck, and yes, that is the Green River Rifle Works 12 bore flintlock made by Allan Vaisham with which Paul is enjoying good sport. Wild duck when roasted in cherry brandied sauce with roasted potatoes, carrots, onions and pumpkin, with garden-fresh minted peas, all washed down with a glass of your favourite beverage is a feast fit for any king – You won’t get a finer meal. 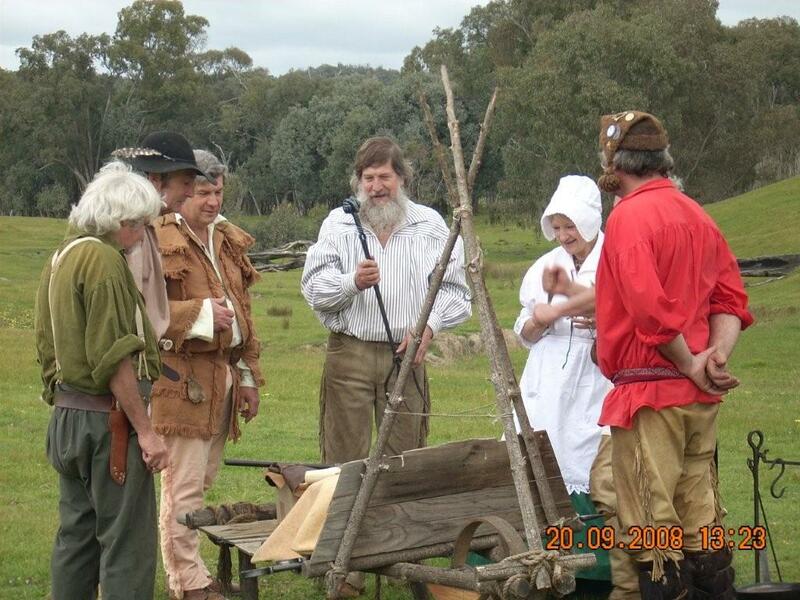 August 8th for Colonials – a Ned Kelly Heritage Market tent display, Beechworth. Police paddock behind the Old Beechworth Court House. 9am–4pm, a one day only publicity display. Dress early Colonial – similar to the Gold Rush event of Easter 2008. Annual General Meeting 3.30pm Saturday 19th September at Beaver Creek R’voo. One day at May camp Jim and Murray both handed me different copies of Mountain Man speak – “The Language of R’voo” and “A Glossary of Mountain Man terms and Expressions”. Some good stuff for our newsletter, they said. All good stuff gleaned from the internet, but personally I have difficulty catching onto some of the terms which appear decidedly 20th century. That said, I figure to include some of these explanations as little gap fillers to our regular articles. A man who had the experience of wintering over in the mountains a year or two, and no longer a greenhorn. They were also known as “Winterers”. 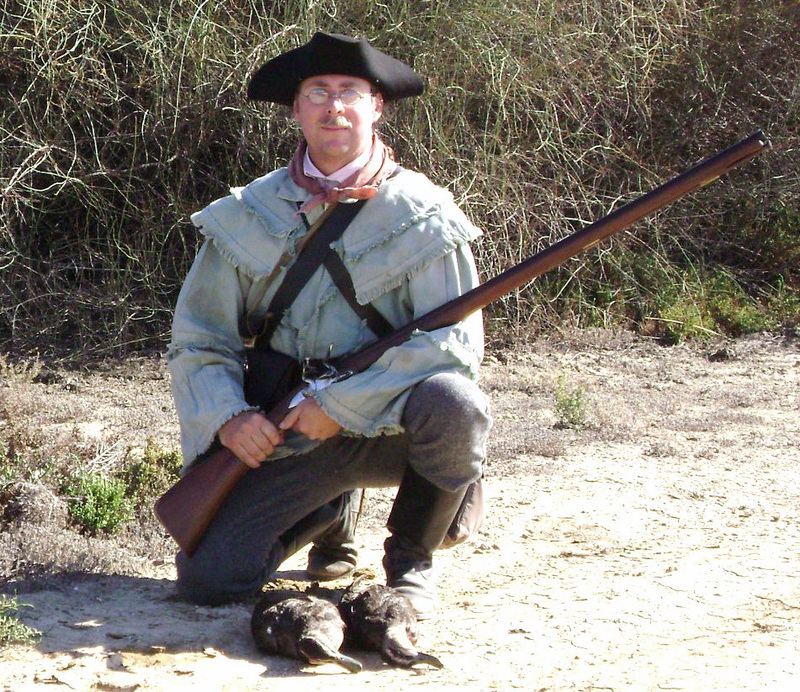 Lonesome Louie & Fast Freddie first appeared in Muzzleloader magazine. Unspun flax used for cleaning firearms; also used as tinder. Just mentioning those things that seem to transgress the most without pointing the finger – Elastic sided moccasins, particularly after a little rain when the side seam Mocs get soaked, eh Jim? But our president noticed a few other anomalies such as a plastic dinner plate – doh! Stainless steel cooking utensils, and enamel wares – Really, Bob! But plastic bags disguised as buffler bladders – That just won’t wash Ron! Sadly, we report the passing of Keith “Old Injun” Hansell on 26th May 2009. 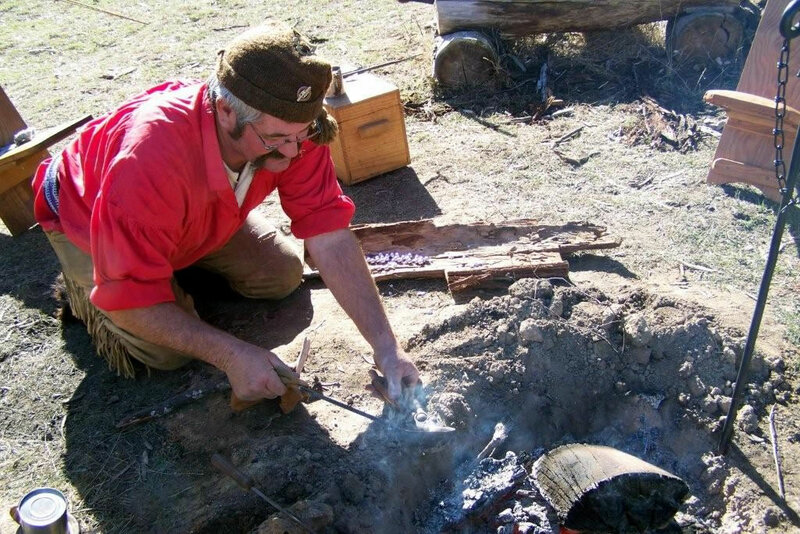 A black powder shooter and rendezvous enthusiast for many years, Old Injun was a scribe for the earlier Pine Mountain Long Rifles group in Queensland, and a driving force establishing the bi-annual rendezvous at Millmerran. In younger days Keith and wife Maureen were regular visitors to Victorian rendezvous. At the recent Seymour Alternate Farming Expo the Free Trappers displayed this poster of Old Injun and Glen Mitchell taken along the banks of the Carboor behind Glen’s farm on one such visit. It was Keith’s favourite photo. Our condolences go to Maureen and family. Old Injun and Glen Mitchell checking the creek banks for sign. Winter Quarters Camp, Queen’s Birthday weekend, June. Congratulations to eight members of the Free Trappers group who have now winter camped in the Highlands four or more years in a row. Louise and Justin Fletcher, Bob Ellis, Chook Fowler, Paul Sly and Jim Walker each have attended all five winter rendezvous, while brothers Ian and Murray Convey have done the past four years since learning to read “Come to Popo Agie” signs. All eight receive the club Hivernants award. Waugh! A special thank you to Jim, who before leaving our May Turkey Hunt camp set to with chain saw and cut a heap of firewood ready for Winter Quarters. We decided to locate our camp on a great new spot – a small plateau overlooking the Painted Pony Plains and sheltered from the vicious southerlies carrying snow to the high country. The wet weather forecasts did not deter hardy Trappers who had chosen to arrive early on the Friday adding time to the scheduled long weekend. Paul & Chook were first to arrive, then Jim, Bob and John. Murray and Ian made it around midday after some unscheduled repairs to Murray’s maverick mule. Their appreciative thanks go to the Romsey Garage sporting gents for their generous helping hand. Ron Davis arrived on Saturday, an invited guest known already to most of us, and particular of the company he keeps; this pilgrim can cook good rabbit too. Ron soon became our newest member and we look forward to him and Mary sharing more shining times with us. Extra canvas shelters seemed to be all the go as we weathered low cloud and frequent short showers. It was lean times for the hunters with a couple of foxes being sighted but none taken. No matter! Just poking about in the scrub with cow’s knee protecting one’s flintlock is reward enough. A fox pelt or a fresh rabbit is a bonus. Last to arrive in camp were Justin and Louise with little 4 year old Rohmi. Their cosy Voyager tent was quickly erected in time to ward off more rain squalls. Rohmi on his second Rondyvoo was clearly enjoying the outdoors with Trapper mates, camp tucker, warm fires, the rain and the puddles, stories and a favourite song – Yo ho, little fishy! Jim got busy sighting in his brand new Lyman trade rifle while Ian was trialling a .53 cal barrel he had recently restocked. A .520″ round ball mould ordered from Dixie Gun Works arrived just in time to knock up a batch of pills for the weekend. We did not have a clear winner for our Missouri Boat Ride shoot. Paul looked a cert but Murray was throwing out a hot lead challenge, however no one sent that ferryman down the rapids. We’ll just have to continue this one when next we rendezvous. The close weather saw the group sheltering often, sharing a hot cup and telling tall stories about past hunts or shoots. Oh, but we did get in plenty of fun shoots just the same. A toast to everyone who made the most of our traditional Winter Quarters camp and shoot event – in rather more challenging conditions than past years. A tall story, no doubt!